The longer I’m in the golf world (and life for that matter! ), I’ve come to realize that golf – like life, is all in your mind. Now you may be thinking; why then do I spend so much time trying to improve people’s bodies? And the answer to that is what I heard Deepak Chopra say once, “The Body IS the Mind”. Our thoughts, emotions, etc. are actually contained in our bodies, so it makes sense that if our bodies are functional, our minds will become functional. I’ve also noticed that THE main difference between Great Putters and Poor Putters is primarily on how they visualize their putts. Ie, some great putters S-E-E the putt dying into the hole – other great players like Tom Watson and Arnold Palmer charged it, etc. 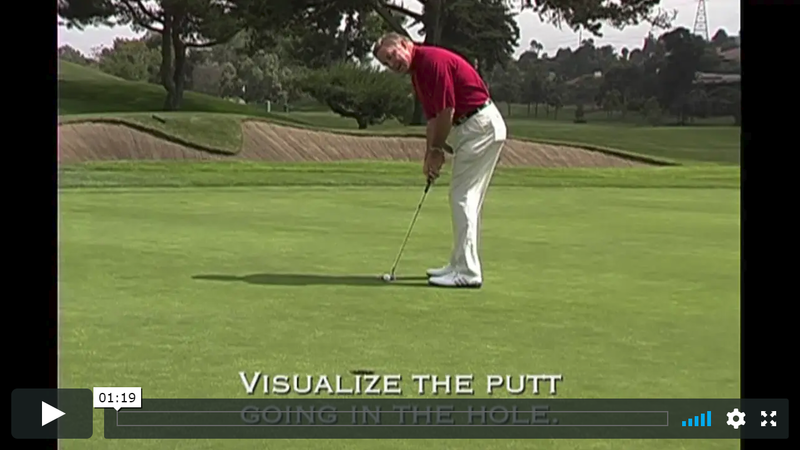 Regardless, ALL great putters visualize the type of putt, break, speed, etc., that the putt requires , whereby their eyes immediately program their brain, which then programs their bodies – and putting stroke. A lot of high handicappers and poor putters tend to focus on their strokes and not the intended putt. In summary, I highly suggest that you spend a little more time visualizing the line of the putt, then rehearse the stroke WHILE LOOKING AT THE LINE, then TRUST IT – AND LET IT GO! !